During the first half of the 15th century, the Portuguese were encouraged by Prince Henry the Navigator to explore the coasts of Africa. In 1492 Christopher Columbus sailed further west into the Atlantic Ocean and discovered islands that he thought were close to Asia. A few years later, Vasco de Gama reached India by sailing around Southern Africa. In 1522, one of the ships in Magellan’s fleet returned to Europe and brought proof that it was possible to circumnavigate the Earth. In a few decades, the way that Europeans saw the world had been completely transformed. Before Christopher Columbus, other European sailors had reached the coasts of America, which we know since there are traces of their presence on these shores. However, this maritime exploit by a few hundred men did not lead to long-term settlement. Marco Polo left Venice with his father and uncle in 1271. Travelling to Ormuz, Central Asia and Mongolia, the three men reached Khanbalik, today’s Beijing, and were welcomed to the luxurious Mongol court. Marco Polo became an adviser to Emperor Khublai Khan and travelled extensively through China. Ibn Battuta was born in Tangier half a century after Marco Polo. For more than thirty years, he travelled to the Middle East, Africa, Central Asia, India and China. Ibn Battuta dictated the story of his travels, known as the “Rihla”, to the secretary of the Sultan of Fez. In the early 15th century, China launched an exceptional venture: seven major maritime expeditions to explore the Indian Ocean. Unfortunately, the official archives, with plans of the ships and their logs, were destroyed several decades later, which explains why many aspects of this extraordinary adventure are unknown to us today. In the 15th century, trade in the Indian Ocean was centred on Southern ports on the Arabian peninsula, the Islamic trading posts on the African coast, and ports on the Indian coast. This triangle was then linked to Malacca by merchant ships travelling to Sri Lanka and the Bay of Bengal, thus making a huge semi-circle stretching from Japan and China to the Spice Islands and Java. In order to circumvent the Muslim monopoly on trans-Saharan caravans, around the year 1420 the Portuguese sought access to rich African resources by ship. Encouraged by Henry the Navigator, they sailed out to Africa but had no knowledge of the coastal waters beyond Cape Bojador. King Manuel I of Portugal chose Vasco da Gama to lead the first maritime expedition to India. The passage was opened up by Bartolomeu Diaz who had sailed around the Cape of Good Hope ten years earlier. During the 15th century, the Indian Ocean was still a great mystery to Europeans. In 1487, the King of Portugal gave Pêro da Covilha and Alfonso de Paiva a mission to report on sailing conditions between Africa and India and to make contact with the legendary Christian kingdom of Prester John. During the 15th century, the Portuguese did not know that the world turned on its own axis nor did they have the scientific knowledge to understand atmospheric circulation. It was thanks to their wide-ranging experience as navigators that they overcame the difficult sailing conditions encountered in the Atlantic Ocean. Portuguese expansion in the Indian Ocean, after Vasco da Gama’s first voyage, was remarkable. The first two Viceroys, Francisco de Almeida and Afonso de Albuquerque, founded a network of trading posts and fortresses along the coast. The Treaty of Saragossa 1529 confirmed Portuguese dominance in the Indian Ocean. The first successful expeditions across the Atlantic Ocean raised the question of what to do with the archipelagos and new lands discovered by these navigators. In 1479, Portugal and Castile signed an initial treaty confirming Castile’s dominion over the Canaries, while recognizing Portugal’s monopoly on the African coast. In the 3rd century BCE, Eratosthenes calculated the circumference of the Earth with remarkable precision. In later centuries, other Greek geographers, including the most famous of them all, Ptolemy, suggested a much lower figure for the circumference for our planet. This under-estimation was adopted by 15th century map-makers. Christopher Columbus sailed under the Portuguese flag, but it was Isabella of Castile who provided the funds for his project to sail to Asia by a western route. His flotilla of three ships set sail from Southern Spain on 3 August 1492. He headed first for the Canary Islands, before setting off across the Atlantic Ocean and discovering islands near the American continent. 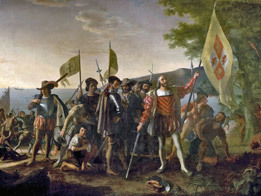 In the years following his first voyage, Christopher Columbus carried out three more journeys, but with better resources than in the past. He explored the ring of Caribbean islands, founded the colony of La Isabella on the island of Hispaniola, discovered the huge delta of the Orinoco and sailed along the coast of today’s Honduras. Following Christopher Columbus’ discovery of the New World, several expeditions tried to reach China and the Indies by sailing west. Gradually, the Europeans found themselves sailing along the coast of a new continent. The expedition led by Magellan was expected to sail as far as the Spice Islands to the west by sailing around the American continent. It was financed by Spain, which hoped to gain access to these islands and their spices without crossing the Indian Ocean, then dominated by the Portuguese.